MINISTER OF HEALTH HON. 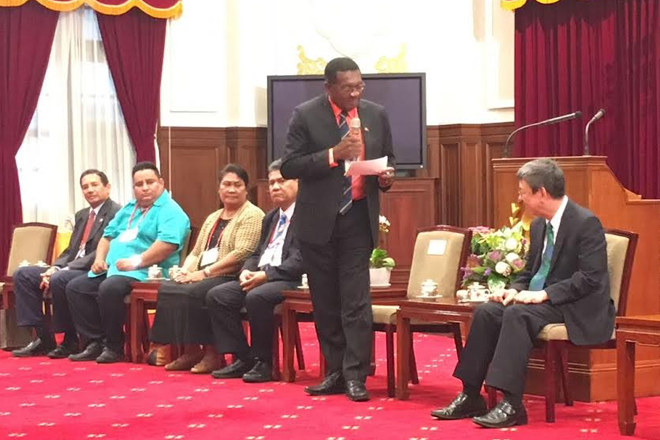 EUGENE HAMILTON IS CURRENTLY IN TAIWAN ATTENDING A GLOBAL HEALTH FORUM. Minister Hamilton was an invited guest to the Forum on Global Health in the Taiwanese capital this week and took the opportunity to hold discussions with government officials in the areas relating to health and fisheries. The Global Health Forum is a two day event which brings together Ministers of Health, practitioners and specialists to discuss emerging issues relating to health and wellness, within the framework of the millennium development goals. The conference, which was opened by the President of the Republic of China (Taiwan), Dr. Tsai Ing-wen, also provided information on myriad issues including trade and health from the perspective of the Pacific island nations and race and health from the perspective of the United States. Following the Forum, Minister Hamilton met with officials from the Fisheries Agency within the Council of Agriculture and discussed the possibility of a collaboration with Taiwan with an emphasis on aquaculture. In an earlier meeting with Taiwan’s ICDF, a project to address chronic diseases in the Federation was further explored with the goal of a start date of the first quarter of 2017. In a demonstration of a commitment to the project, a visit to Taipei Veterans General Hospital was arranged (the institution that will coordinate the project) for the Honorable Minister. “Saint Kitts and Nevis looks forward to partnering with this institution and we will certainly benefit from Taiwanese experience and expertise in the area” stated Minister Hamilton to the superintendent of the Hospital. Following a detailed presentation on Taiwan’s efforts to prevent the deterioration of chronic kidney disease, Minister Hamilton was able to view first hand Taiwan’s advances in this area with a visit to the Renal Department in the hospital. Minister Hamilton, along with his ministerial colleagues also met with the Vice President of the Republic of China (Taiwan), H.E. Chen Chien-jen, and was hosted by the Deputy Minister of Foreign Affairs of Taiwan, Javier Hou and the former Ambassador of Taiwan to the Federation, H.E. Ambassador Miguel Tsao. Students from the Federation of Saint Kitts and Nevis in Taiwan also had the opportunity to dine with Minister Hamilton. H.E. Ambassador Huggins accompanied Minister Hamilton during his visit in Taiwan.